Edith Hamilton (August 12, 1867 – May 31, 1963) was a classicist and educator who was a writer on mythology. Her most famous books are The Greek Way (1930) and Mythology: Timeless Tales of Gods and Heroes (1942). Mind and spirit together make up that which separates us from the rest of the animal world, that which enables a man to know the truth, and that which enables him to die for the truth. He was, first and last, the born fighter, to whom the consciousness of being matched against a great adversary suffices, and who can dispense with success. Life for him was an adventure, perilous indeed, but men are not made for safe havens. The fullness of life is in the hazards of life. And, at the worst, there is that in us which can turn defeat into victory. Even of old the Christian world, so bitterly antagonistic to any ideas not specifically contained in their creeds and dogmas, made an exception in Socrates’ case. They recognized his likeness to Christ. He was the example that a soul could be Christlike, not through grace, but by nature. Erasmus said: "Holy Socrates, pray for us." To know him is a help to knowing Christ, and it is not hard to know him. We can see him quite clearly. Plato, who drew his portrait, could not, of course, keep himself out of it, any more than Christ’s recorders could; but at least magic did not dog Plato’s footsteps, as it did everyone’s footsteps when the Gospels were written. In the fourth century B.C. Greeks had no leaning to marvels. Also in the centuries that followed no one founded a church on Socrates and built up around him a theology and hung creeds and ceremonials upon him. To see what he was, we do not have to brush anything away, except a bit of Plato. We can use him as a stepping stone to Christ, a first aid in realizing what Christ was. They were the first Westerners. The spirit of the West, the modern spirit, is a Greek discovery; and the place of the Greeks is in the modern world. The anthropologists are busy, indeed, and ready to transport us back into the savage forest, where all human things...have their beginnings; but the seed never explains the flower. To rejoice in life, to find the world beautiful and delightful to live in, was a mark of the Greek spirit, which distinguished it from all that had gone before. It is a vital distinction. [Happiness is] The exercise of vital powers, along lines of excellence, in a life affording them scope. The Greeks were the classicists of antiquity, and they are still today the preeminent classicists. What marked all they did, the classic stamp, is a direct simplicity in expressing the significance of actual life. It was there the Greek artists and poets found what they wanted. The unfamiliar and the extraordinary were on the whole repellent to them, and they detested every form of exaggeration. Their desire was to express truthfully what lay at hand, which they saw as beautiful and full of meaning. But that was not the Roman way. When not directly under Greek guidance, the Roman did not perceive beauty in every-day matters, or indeed care to do so. Beauty was unimportant to him. Life in his eyes was a very serious and a very arduous business, and he had no time for what he would have thought of as a mere decoration of it. 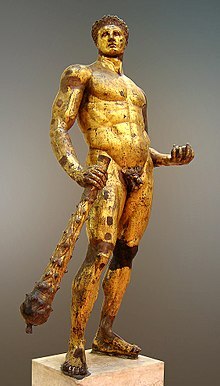 The greatest hero of Greece was Hercules. He was a personage of quite another order from the great hero of Athens, Theseus. He was what all Greece, except Athens, most admired. The Athenians were different from the other Greeks, and their hero therefore was different. Theseus was, of course, bravest of the brave, as all heroes are; but, unlike other heroes, he was as compassionate as he was brave, and a man of great intellect as well as great bodily strength. It was natural that the Athenians should have such a hero, because they valued thought and ideas, as no other part of the country did. In Theseus their ideal was embodied. But Hercules embodied what the rest of Greece most valued. His qualities were those the Greeks in general honored and admired. Except for unflinching courage, they were not those that distinguished Theseus. 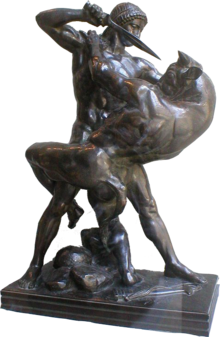 Hercules was the strongest man on earth, and he had the supreme self-confidence magnificent physical strength gives. He considered himself on an equality with the gods. Fundamental to everything the [ancient] Greeks achieved was their conviction that good for humanity was possible only if men were free, body, mind, and spirit, and if each man limited his own freedom. A good state or work of art or piece of thinking was possible only through the self-mastery of the free individual, self-government. What the people wanted was a government which would provide a comfortable life for them, and with this as the foremost object ideas of freedom and self-reliance and service to the community were obscured to the point of disappearing. Athens was more and more looked on as a co-operative business, possessed of great wealth, in which all citizens had a right to share... Athens had reached the point of rejecting independence, and the freedom she now wanted was freedom from responsibility. There could be only one result... If men insisted on being free from the burden of a life that was self-dependent and also responsible for the common good, they would cease to be free at all. Responsibility was the price every man must pay for freedom. It was to be had on no other terms. - Chapter 2, "Athen's Failure"
Through Plato, Aristotle came to believe in God; but Plato never attempted to prove His reality. Aristotle had to do so. Plato contemplated Him; Aristotle produced arguments to demonstrate Him. Plato never defined Him; but Aristotle thought God through logically, and concluded with entire satisfaction to himself that He was the Unmoved Mover. - Chapter 4, "The School Teachers"